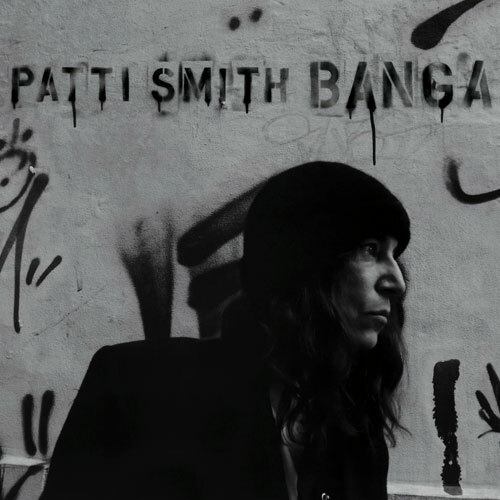 Few artists are held in such high esteem among critics and music historians as Patti Smith. Never one to rush her work, she has just released Banga, her first collection of original songs in eight years. On this record, Smith took her inspiration from her travels with husband/guitarist Lenny Kaye. The result is a set of narrative songs that incorporate many World sounds and rhythms into Smith's usual punk-poet aesthetic. That combination yields results like "Fuji-San", with it's passionate vocal delivery, and the elaborate and textured eastward journey of "Mosaic". The slow, arty "This Is The Girl" has a New York-era Lou Reed vibe to it, which doesn't make it a standout. That Reed sound returns with stronger results on the title track. Johnny Depp contributes guitars and drums to a song that is part "Black Angel's Death Song", part World rhythm. The most surprising track is "April Fool". With Tom Verlaine on guitar (he also appears on "Nine") it is a straightforward song that verges on pop. It's something one would expect from Chrissy Hynde rather than Patti Smith. Of course, it wouldn't be a Patti Smith record without a helping of spoken word performance. Typically, the spoken word is more seductive when it comes as part of a more musical piece, and that hasn't changed. Therefore, a track like "Amerigo", which alternates spoken word verses with a captivating melody, is far more accessible than a wholly spoken "Tarkovsky (The Second Stop Is Jupiter)". Slower numbers, like the methodical piano-based "Maria" and the glacial strings of "Seneca" are easily forgotten. The inclusion of a cover of Neil Young's "After The Gold Rush" is a welcome palate cleanser. Banga is definitely an uneven record. It has moments that will stick with rock fans, but it also has moments (like the 10-minute "Constantine's Dream") that make it seem like Smith is daring people to like it. As a whole it will likely hold more appeal to those rock critics and historians than it will to the actual music fan.